It’s true, I know, that Australian poetry is neglected on this blog, but I often feel my limitations as a reader when I come across it in the pages of the newspaper. It’s not as if I dislike poetry: I liked the war poetry we did at school, the popular ballads we used to learn off by heart and the ones my mother and her friends used to recite on convivial evenings, such as The Green Eye of the Little Yellow God. I liked the poetry I read at university, especially T.S. Eliot’s Four Quartets and Milton’s Paradise Lost, and I’m also fond of John Donne’s more salacious poems and Ovid’s Amores. Somehow, I don’t feel the same pressure to make sense of these works, as I do when reading contemporary poetry. The blurb tells me that the poems are drawn from Powell’s ‘enchanting and disorientating’ experience of moving to Helsinki in Finland, and his struggles with ‘fluctuating perceptions and the relationship of language to meaning and aesthetics’. We are granted another chance. Woken by birds and a stripe of light on the legs. spring day, and that all images will one day be unsalvageable. Blue monotone sky, dark lace shadows of hazel coppice. I like the tentative references to what might be love, and I like the way he has developed that strange feeling we Aussies have when we wake and find ourselves on the other side of the world where even the sky is unfamiliar. Where the first signs of Spring are not bursts of wattle but ducks and butterflies. I like the repetition of the word ‘still’, and the playfulness of the poet inventing a word like ‘enspheres’. I also really liked The True Map: ‘mislaid / folded in haste / so the towns are rubble in the creases / and roads erased’ and I enjoyed the humour of The Morning After the Protest and its image of Adam Lindsay Gordon nipping into the Windsor for a tipple afterwards. Well, I don’t have much experience with modern poetry, but I enjoyed dipping into this slim volume of poems. If you think you might too, click the links below and buy a copy! 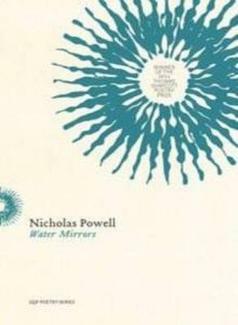 Fishpond: Water Mirrors (UQP Poetry Series) or direct from UQP.